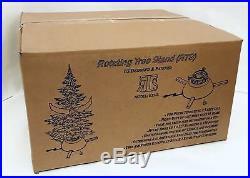 Rotating Christmas Tree Stand for live tree. Ideal for home decoration and gift. 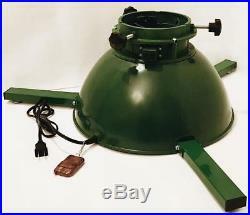 Heavy-duty rotating tree stand for fresh cut trees with remote control. 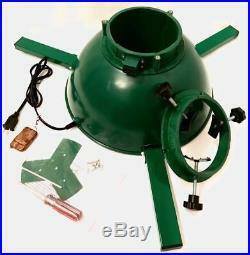 Heavy-duty Rotating Tree Stand can be reusable for 10+ years. Holds up to 5.5 diameter trunk & 7.5 feet, 150 lb. Outriggers with adjustable feet help to stabilize the tree. Water reservoir rotating with the tree holds water to keep tree fresh. 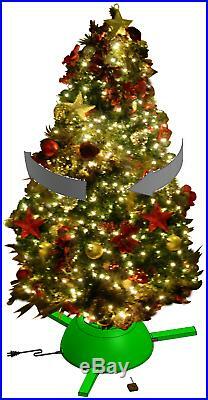 Tree with electric power receptacle rotates one revolution per 2 minutes. On/Off remote-control tree rotation and lights. Product powered by US 120vac/5Amps. Power receptacle accepts 550watts of tree lights. Package size:17x17x9 and package wight:18.8lbs. Designed and Patented in USA. 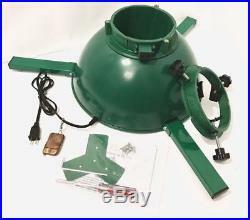 The item “Rotating Christmas Tree Stand for live tree” is in sale since Friday, October 12, 2018. 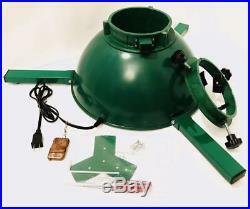 This item is in the category “Home & Garden\Holiday & Seasonal Décor\Christmas & Winter\Tree Stands, Skirts & Storage”. 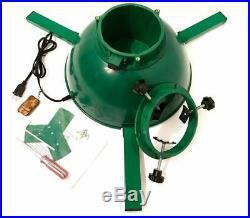 The seller is “llshi1024″ and is located in Corona, California. This item can be shipped to United States.